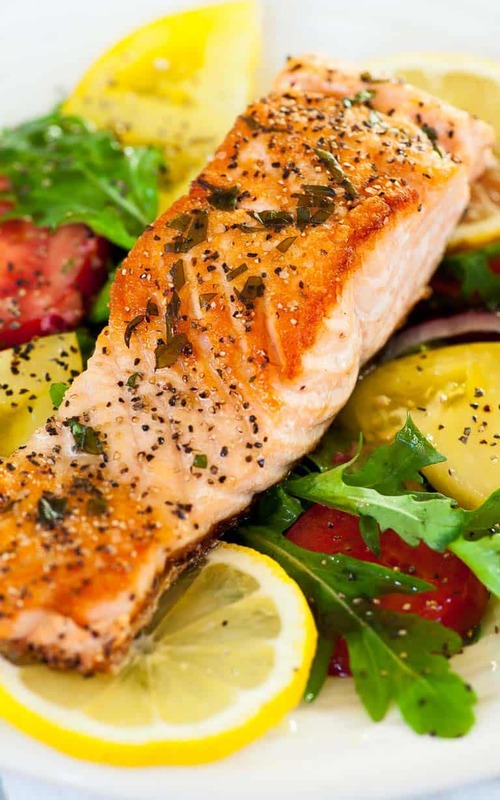 Here’s a real low calorie meal idea…pan-fried salmon with arugula salad. Use garden fresh tomatoes and arugula with a garlic basil vinaigrette. The combination is fabulous. We haven’t had salmon for a while and it’s just the best for a quick and tasty meal. I decided to pan-fry the salmon which was cut into individual portions from a 2 pound fillet. It produced 5, nice 6 1/2 to 7 ounce salmon steaks. This was skin on salmon and the best way to cook it is in a hot skillet. Use a cast iron, carbon steel or stainless steel fry pan and not a non-stick skillet. You need the temperature to get up to 400° or more which would be detrimental to the non-stick surface. Take the salmon out of the refrigerator about 30 minutes before cooking to get up to room temperature. This will make it easier to get a nice crispy skin. Next, start with a layer of vegetable oil in your pan and turn your stove to medium high heat. While you’re waiting for the oil to heat up, use paper towels to dry the salmon, then coat generously with salt and pepper. Once the vegetable oil is shimmering, carefully lay in a piece of salmon, skin side down. Use a fish turner or spatula and gently press down on the fish for a few seconds. Once the skin hits the hot oil, it will shrink slightly and you want all the skin to make good contact with the skillet. Add the other portions to the skillet as above but don’t overcrowd. Three portions will fill a 12″ skillet. Turn the heat down to medium to medium low and let the salmon cook for 4 or 5 minutes. You will see that the salmon is getting done by the white color rising up from the bottom. Once half to two thirds of the salmon sides have turned white, carefully flip the fish and continue cooking for another 2 to 3 minutes until most of the red flesh has cooked. Remove from the heat and let it rest for a couple minutes covered with foil. 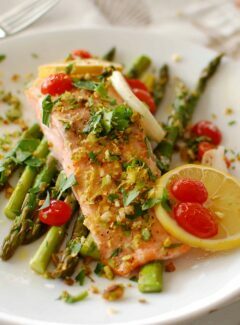 This will give you a salmon steak that has a crisp skin and slightly crusty exterior but a juicy, flaky interior. Tomatoes in the garden are starting to ripen and a simple salad is the perfect thing to have with the pan-fried salmon. I made a vinaigrette using garlic, red onion, fresh basil, lemon juice, vinegar and olive oil. I put everything in my Kitchen Aid 3 1/2 cup food processor and pulsed until all the ingredients were well chopped. 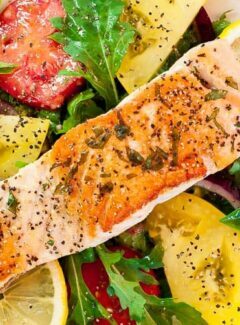 Toss the salad with the vinaigrette and you can even drizzle a bit of the vinaigrette on the salmon. Disclaimer: This post contains an affiliate link, which means that Joe’s Healthy Meals will earn a small commission if anything is purchased through this link. Easy, low calorie meal that's fast to prepare. 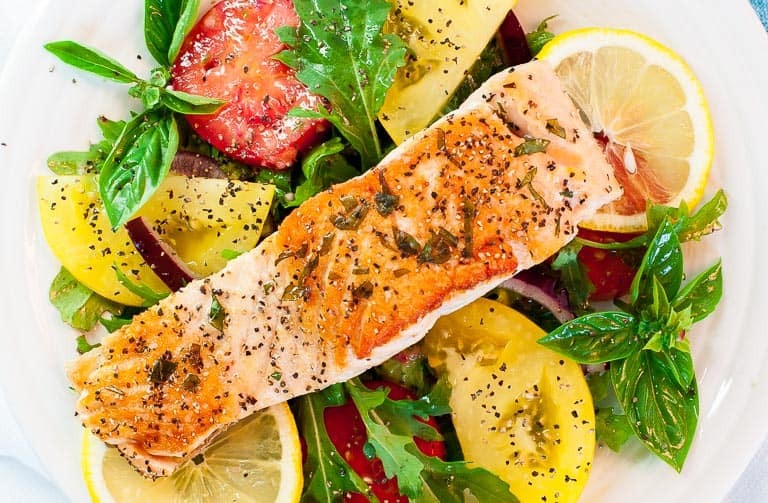 Remove salmon from the refrigerator 30 minutes prior to frying. Then pat dry with paper towels and coat with salt and pepper. Add vegetable oil to a heavy skillet, (not non-stick), and heat on medium high until the oil is shimmering. Lay in the salmon, skin side down, pressing the fish with a fish turner or spatula to insure contact with the skillet. Do not overcrowd the skillet. 2 batches may be required to cook the fish. Fry 4 to 5 minutes until the salmon has cooked through half way, turn and fry the second side 2 to 3 more minutes until the red flesh color is nearly gone. Times may vary due to the thickness of the salmon. Remove from the skillet and cover with foil, to rest and finish cooking. Serve hot. Place all ingredients in a food processor and pulse until ingredients are about 1/8th inch chopped. Add to the salad. I used 1/2 of the vinaigrette on the salad and served the remainder on the side, being used as desired. Assemble salad ingredients in a bowl, drizzle with the vinaigrette and toss to combine. 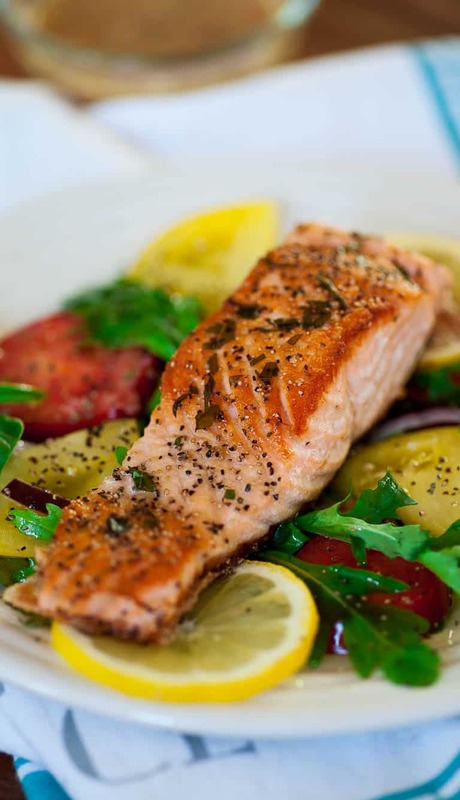 Here are a couple more salmon recipes you may like to try. 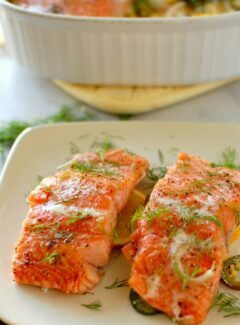 Slow baked dill and citrus salmon. I just came back from a very successful fishing trip at my local Sam’s Club, so this is another perfectly timed recipe for me to try!! Sounds good. I just bought some Sockeye. I’ll have to try this.